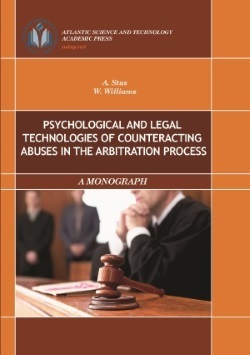 The monograph is devoted to the research into the problems of using psychological techniques in practical professional activity, in particular, to arbitration abuse counteracting technologies. The book widely covers methodological foundations of psychological impact in the professional activity of the judge; the theoretical and methodological background of studying problems psychological and legal technologies of counteracting abuses in the arbitration process and the results of its empirical and experimental research; praxeological foundations of psychological influence in the professional activity of the judge and psychological and legal preparation of the judges to use abuse counteracting technologies. It is intended for psychologists, experts in the field of law-enforcement activity, as well as for a wide range of readers. 426 pages, print-run of 500 copies.